Disclaimer: neither myself or the University of Kent have any affiliation to shops or brands mentioned in this blog post. As an older student, or any student to be honest, it is crucial to save money whenever possible. I’m sure we are all in agreement that student maintenance loans and part-time work are never quite enough to live on whilst at university. There are a whole host of ways to save money and get a deal on almost anything, but the monthly grocery shop is probably the biggest thing that needs to change when on a budget, so here are just a few little tips that I have picked up in recent times. I find doing an online shop, usually every other month, for large items and non-perishables works really well; and I normally buy my tins, jars, rice and pasta, breakfast cereals, wine and bottles of fizzy drink in this way. I use Sainsbury’s and it’s good because I only buy what I actually need, and the special offers are listed for each food category. On average a £50-£60 shop contains around £10 of savings. I always pick one of the cheaper delivery slots too. Most of the time it works out more economical to buy the larger size of something, especially when it comes to cleaning products in Wilko for example. Yes, there are nearly forty washing machine tabs in the box, or yes, it’s a three-litre bottle of orange squash which will last forever, but they are cheaper in the long run. Check out the pound stores. Look for the deals on toiletries in Wilko, Superdrug and Boots. It’s all about the 3 for 2’s and other special offers. Wilko is great for household stuff and cleaning products as well. I also regularly visit Iceland for the deals on frozen produce and low prices on non-frozen too. My wallet is full of them. My most used is the Nectar card as I earn points on my online shop and also in the small Sainsbury’s on the corner near Canterbury West railway station. It all adds up! 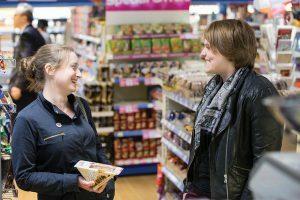 Don’t forget also that the NUS card gives you 10% off in Co-op stores, of which there is normally at least one in every town and the SU Shop on campus stock their products too. I also use an Iceland Bonus card to save £2 or £3 each month, so when it comes to my monthly shop in December there is around £30 or so to use for food shopping, allowing some spare cash for buying Christmas presents. Something I haven’t tried yet but widely accepted as a great idea, is making certain meals in bulk and then freezing portions in Tupperware boxes for when you need them. The meat and sauce part of Chilli con carne or Spaghetti Bolognese for example, can easily be made in this way.